When I first watched ‘Advent Children’, a previous Final Fantasy film, I was blown away by the stunning visuals that I’d never really seen in a movie before. ‘Kingsglaive’ has given me that same feeling again, but on a much larger scale. 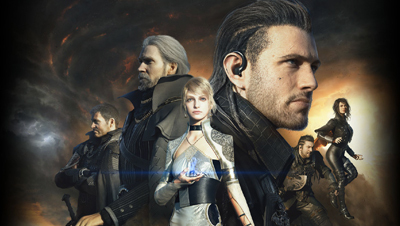 The main aim of ‘Kingsglaive’ is to set the scene up for the upcoming game, ‘Final Fantasy XV’ – taking place before the game begins, we see the struggle of King Regis (Sean Bean), Noctis’ father, as he tries to protect his vibrant city Insomnia from the enemy empire Niflhelm. Reluctantly he agrees to enter a truce with the empire after his strength starts to fade, and then…lots of stuff happens. Unfortunately, I’m not quite sure what really happened during the film. As with ‘Advent Children’ and ‘The Spirits Within’ we’re seeing the same problem yet again – a story so ridiculously complex and detailed that there’s no way in hell of following it throughout the whole two hours. That’s not to say it’s a bad story, as it’s actually pretty awesome – one film just doesn’t do it justice though. Aaron Paul stars as main character Nyx Ulric, a dedicated soldier of the Kingsglaive who lands with the role of protecting Princess Lunafreya (Amanda Piery) as she visits Insomnia during the time of the truce. You know it’s not going to end well, and it most certainly doesn’t. To make things a bit more complicated (not that it needed it), Nyx’s good friend Libertus (Liam Mulvey) finds himself confused as to how his beliefs fit in with the King’s, and so a resistance starts to form. Aside from the complicated story, the visuals are what really makes this film. It still feels weirdly like a game – perhaps the way each scene seems more like a cutscene – but each one will keep your eyes glued to the screen. The fight scenes in particular are incredible, with the choreography and the use of light just flawless. The way that time is manipulated further adds to this – movement slows down and speeds up effortlessly, making each action stand out. The detail is what really gets you though – the hair, the eyes, the architecture… If it weren’t for the magic powers of the characters and the giant beasts, you’d almost be convinced that what you were watching was in fact the real thing. I was also really impressed with the sound – as with the games, the soundtrack is both beautiful and apt, and you’ll definitely want the audio as high as you can get it after hearing how powerful it is (not including the character audio, which sadly never lives up to expectations when it’s dubbed). The film goes very quickly and I think it’s down to how immersive it all is as a whole – yes, the story isn’t easy, but everything else is just perfect. How you find ‘Kingsglaive’ when you watch it is ultimately down to what set of eyes you are viewing it through. As a standalone film, it’s not that great – far too complicated for the average viewer to follow, or even the more experience Final Fantasy player. But, when you watch it as part of the Final Fantasy series as a whole, it really makes wonderful viewing – as a gamer, I’m giving it 4/5.